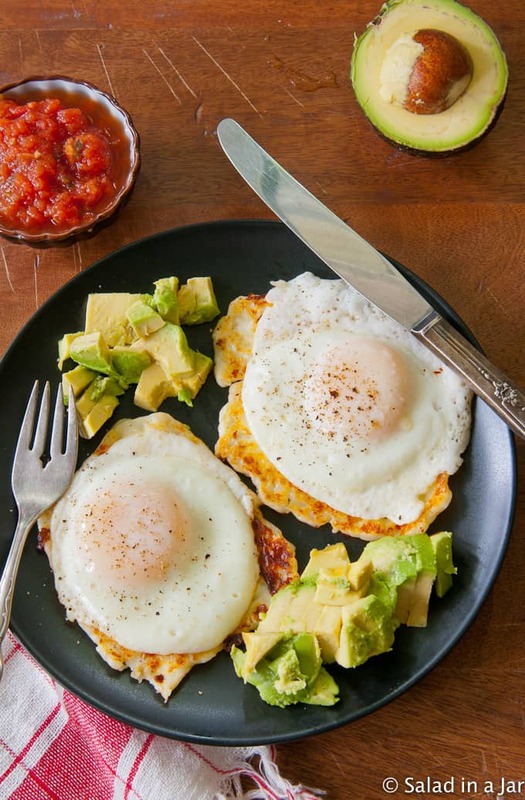 Wake up your drowsy tastebuds with this low-carb Egg-Topped Fried Cheese With Avocados and Salsa on the side. A little Tex-Mex always starts the day off right. In a perfect world, my husband could eat scrambled eggs and bacon for breakfast every morning. On the other hand, I crave variety for breakfast, so I’m always on the lookout for new ideas. My only limitation is the time it takes to prepare. “Quick” is the keyword. A fancy quiche need not apply. 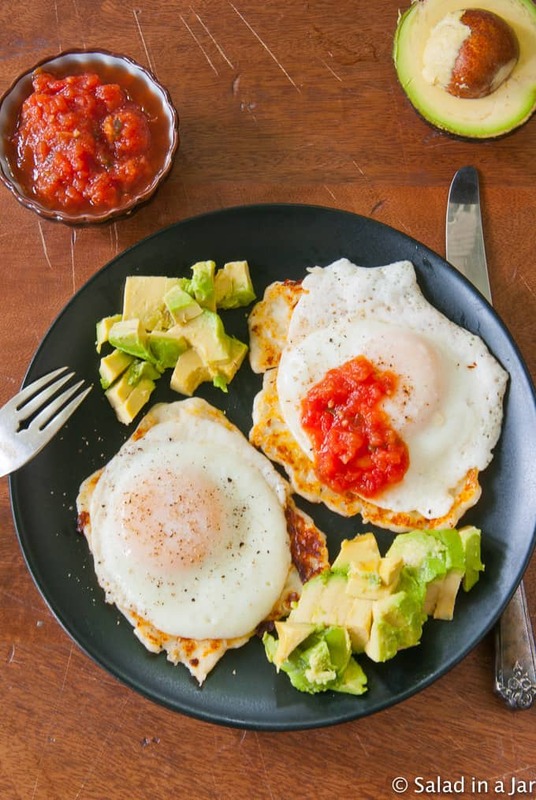 Egg-Topped Fried Cheese With Avocados and Salsa is now my new favorite. Don’t wait to give this a try, especially if you like Tex-Mex in general. I used to enjoy avocado toast before I recognized that excessive carbs were not my friend. Perhaps you’ve discovered the same. Fortunately, fried cheese makes a very fine substitute in some situations–like this one, for example. Be warned that fried cheese will hook you in with its slightly salty taste combined with the crispy outer crust and the soft chewy interior. Because avocados are a vital part of this creation, I am sharing this gadget I picked up a while back. 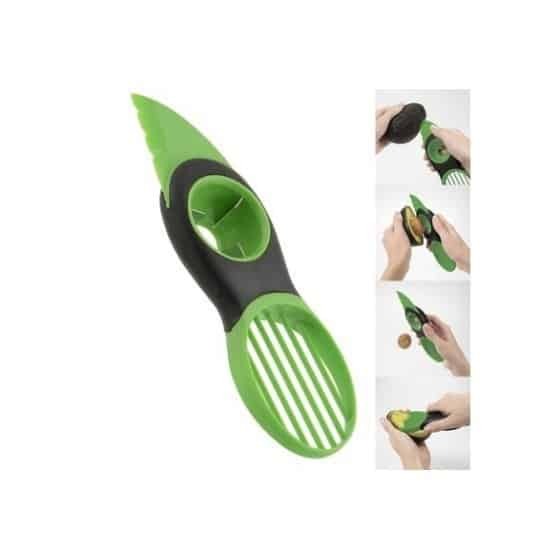 It does everything–slices an avocado in half, extracts the seed SAFELY, then makes it easy to slice and remove the avocado meat in one precise motion. It’s a one-use tool, but I use it nearly every day. So for me, this 3-in-1 avocado slicer is worth the money and drawer space. This is another “unrecipe.” After you make it once, you won’t need a recipe. 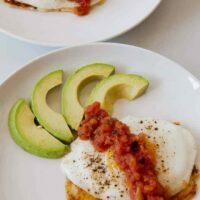 A quick low-carb breakfast with fried cheese and an egg, garnished with avocado and salsa. No wheat in sight. Fry cheese in a non-stick skillet over medium heat, until golden brown on both sides. (When cheese starts to get hot, it releases moisture, sometimes more than others. No worries. As soon as the water evaporates, the cheese will brown and become a little crispy.) Flip cheese and brown the other side. Remove cheese to a plate. 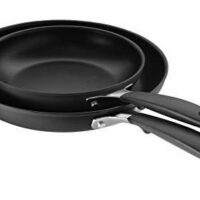 Add eggs to same non-stick skillet over low heat. Cover pan with a lid and cook until white is cooked over the top of the yolk. Season with salt and pepper. Place egg on top of fried cheese. 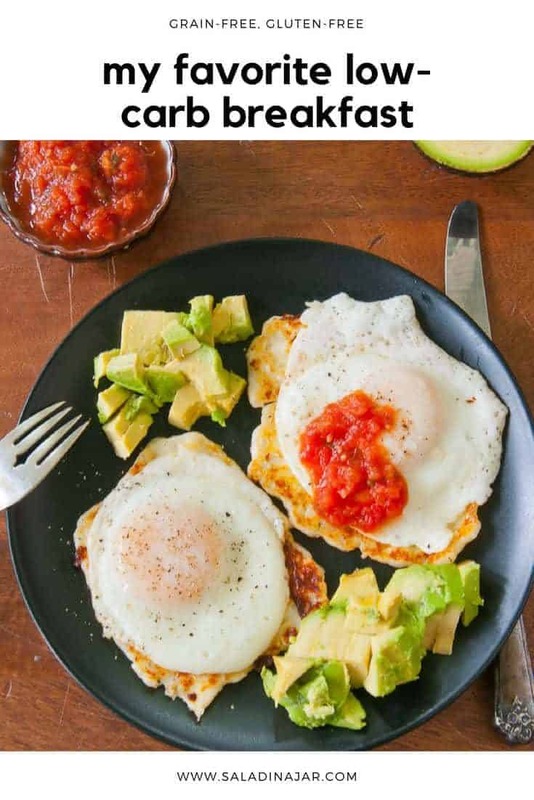 Top with salsa and serve with sliced avocado on the side. Queso Blanco is even better in this recipe, but it's hard to find on a regular basis. Queso Fresco is always available, at least in these parts. Thanks, Paula. I found Carolyn Ketchum just today, so I’m glad you recommend her. I looked up the cheese, and now I know what it is. I have eaten farmer’s cheese quite a bit, and I think this is similar. According to Serious Eats, it is the same as paneer. They have a simple recipe for it, and I may try it as well. It sounds like it would be much better than cheddar with this recipe since it really doesn’t melt. I am not trying to lose weight either. I am slim, and I am satisfied with my weight. I am more concerned about extending my health span. I have been fasting intermittently for the last few years, which has been good for me, I think. Cutting down on carbs is good to avoid insulin resistance as we age, and substituting more protein for carbs has its own problems, so eating a more ketogenic diet makes sense to me. I am not terribly strict with my diet, and I think some starches are good for us. I love sweet potatoes. I also enjoy the occasional bowl of ice cream. (Horrors and heavenly days, as my mother would say – LOL!) I love your blog, and I am so glad you haven’t given it up. This is just the kind of recipe I have been looking for lately. I am trying to cut my carbs, but bread is not my problem, I gave it up years ago. 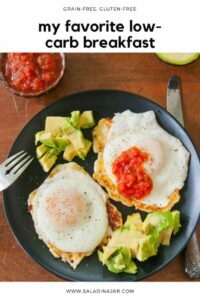 I am trying to eat more ketogenic without increasing my protein intake, and it’s difficult. But this type of recipe is perfect! If you have any more tips, I would welcome them. I am not familiar with this cheese, but I will look for it. Have you ever made it with another cheese? Thanks, Paula, I will try this as soon as I can get to the store! Me too, on the keto thing. I’m not trying to lose weight so I’m not terribly strict when it comes to things like beans or sweet potatoes, but it has changed my whole diet. My only tip is to find some good Keto websites and/or cookbooks. One of my favorites is Carolyn Ketchum. I picked up her cookbook (Everyday Ketogenic Kitchen) at Costco. She has an interesting blog, too. Regarding the cheese, you could try cheddar. It will melt and become a little crispy but I just really love the Queso or the Blanco because it is mild. We have several Hispanic grocery stores as well as a Hispanic section in every supermarket so it’s easy to find here. Here is a link for how to make it at home. https://www.culturesforhealth.com/learn/recipe/cheese-recipes/queso-blanco/ Haven’t tried it myself in this recipe, but I plan to and I’ll let you know. Sounds VERY similar to the way I make Paneer. Hi Paula. This sounds delicious. I checked your list of recipes and did not see how to make paneer cheese. Are you going to write a post on how you make your cheese. I love how you educate us on how to make yogurt and bread, and other delicious recipes. Thanks for sharing your knowledge.